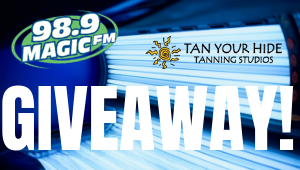 Dallace Jade has another giveaway for you on 98.9 Magic FM! Tune in for the HOT 8 AT 8 p.m. M-F and call in to win! Be the first caller at 719-59-MAGIC (62442) with the correct answer and you WIN! For more information on Tan Your Hide, check out their website HERE!